It hasn't rained for a while, but suddenly your dog comes in from the yard with wet, muddy paws. When you look outside you see a huge puddle on the lawn. You might have a yard water leak! Luckily, The Plumbinator specializes in pinpointing the source of yard leaks and fixing them right. But for now, let's learn more about yard leaks. 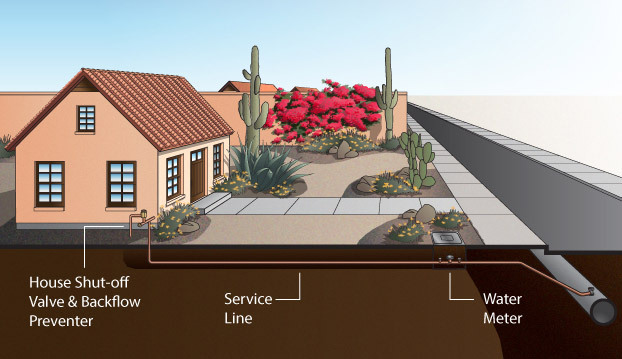 Water travels into your home from the City's water main to your water meter in the yard, then underground through the main service line to your shutoff valve. If your water bill is suddenly sky high, and you see puddles of standing water in the front yard, you probably have a main water line leak. We can pinpoint exactly where along the pipe the leak is occurring, since it may not be where the water is coming up. Water from a leak can flow underground and come up in low spots, hiding the true location of the break. We have specialized high-tech listening equipment so we don't have to dig tons of holes in your yard on a blind fact-finding mission! We'll go right to it, dig it up and fix it correctly. What's that horrible smell? Might be a sewer leak. If you smell sewage and see a patch of unusually lush, green grass, it's a good bet. You may also see a bunch of rats hanging around suddenly in your yard. Yikes! 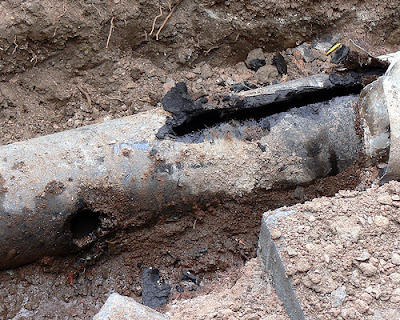 If your home is older, built 1050-1986, your cast iron sewer pipes may be badly deteriorated since cast iron only lasts 50 years. Read more here. Give us a call and we will perform a camera inspection of your line to confirm the leak so we can get to fixing it before the entire neighborhood wonders why it smells like a sewer, or worse: sewage floods your house! If you smell rotten eggs, hear hissing or whistling sounds from your gas line or notice dead grass in your yard, you might have a gas line yard leak. This is a scary situation because inhaling toxic fumes could seriously hurt your family and pets, or even cause an explosion. You need to act quickly. Call The Plumbinator and we will come right over. First, we'll test the whole house gas system with a pressure gauge to confirm the leak, then locate the spot of the leak and fix it for you. Never work on gas yourself or let someone who isn't licensed by the TRC work on your LP gas. It's illegal and dangerous. If you see water spurting out in the spaces between sprinklers, or if you have a high water bill or see wet spots around one specific sprinkler head, you may have an irrigation system leak. Before you call someone, turn on your sprinkler system and look for a "geyser" shooting up from a broken or missing sprinkler head. Check your drip system too, a missing head on one of the smaller tubes can also waste gallons of water. If you do end up finding a leak in your sprinkler system, The Plumbinator can recommend a sprinkler expert to fix it.